Second Chance: Who Doesn’t Need That? I was cleaning my old CD rack and then this came up! Popped into my CD player and rest assured, they will be on repeat forever mode for this whole week! What was the year then? I guess, 1988 or 1989 …yes, the album cover says that. Do you remember this one, Rock & Roll Strategy from 38 Special? Who would forget this album when it had Second Chance packed inside it? Who were they? … glad you asked. 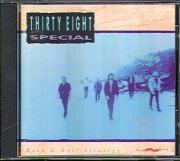 The lead vocals Donnie Van Zant formed the Jacksonville, Florida-based .38 Special in 1975 with Jeff Carlisi who was in guitar, Don Barnes in guitar+vocals, Ken Lyons in bass, Jack Grondin in drums and Steve Brookins was in drums too. I still couldn’t find out why did they name their band as some kinds of pistol ammunition category. Hmm, okay … why would I care when they produced cool song like Second Chance? It’s true that the band’s unique blend of toughness and metal song-oriented southern rock continues to draw more fans even here in Bangladesh. Oh, right, yes … back then I was in Dhaka. Few years back as I was travelling South Carolina, found Millennium music store nearby King Street. Surprisingly they had loads of older collections and Rock & Roll Strategy was one of them. Thanks to Millennium for offloading older CDs real cheap! The pain is all about loosing those golden years … a second chance to start afresh?